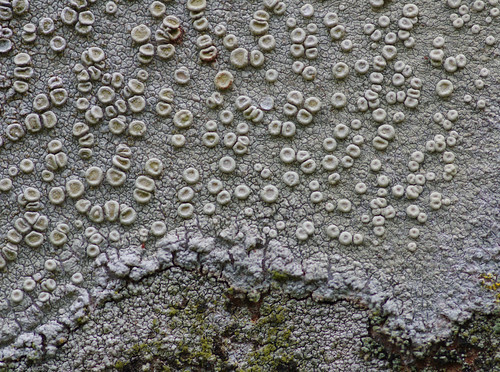 We have been suffering from lichen fatigue in recent weeks. 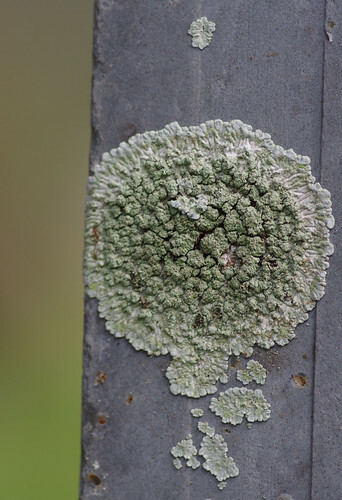 It's not an officially recognised malady but for any lichenologist (especially of the amateur type we subscribe to) there must be a time when you need another diversion. 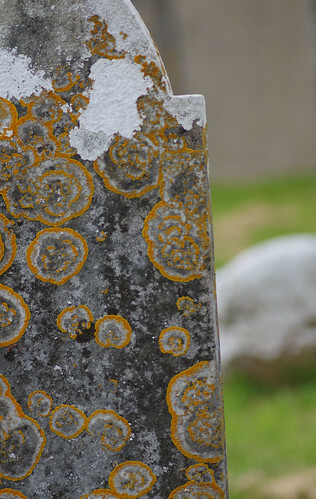 The overload of lichens we found in Stoke Gabriel's churchyard proved a challenge too far, particularly since there were many different specimens of the same species. On the plus side, Sherry obtained some interesting compositions. So even when we failed to make an identification, the photographic results were more worthwhile. Aside from the serene and sober atmosphere of the place there were a variety of headstones to examine. 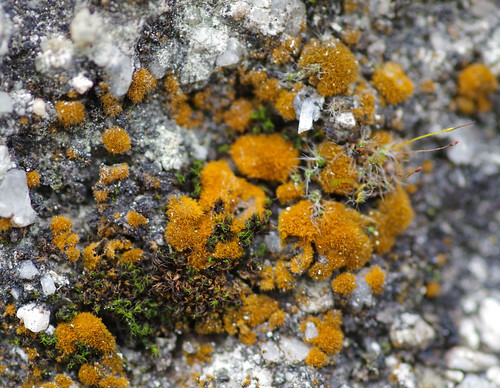 Some species are specialists and stick to one rock type, whereas others thrive almost anywhere. 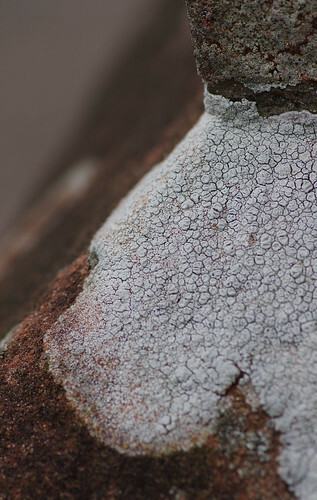 I was hoping this might be a Caloplaca teicholyta. 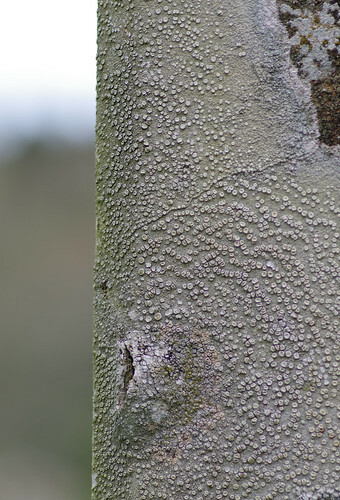 But now I think it is probably a dried-looking Diploicia canescens (as opposed to a wet one). It was perhaps turning into one of those days when our hopes of finding new species got a bit carried away. Rational thought and reasoning sometimes goes out of the window when you think you may have chanced upon something new. This was an impressive specimen to record even though we have seen its like on several occasions recently. 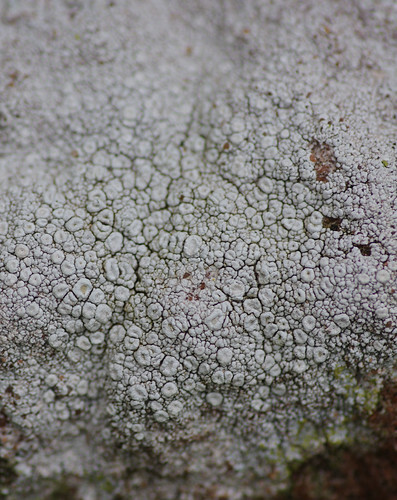 The areas of white suggest it might be mature. 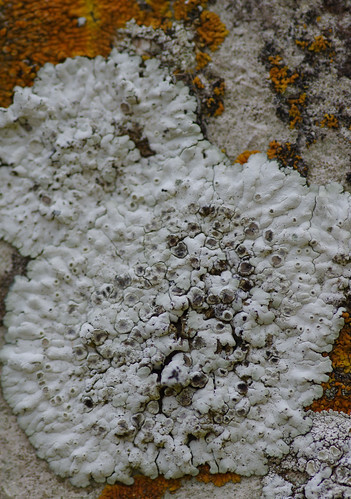 If only there were a reliable means of dating lichens. If there was then perhaps their lifespans would be measured in generations! And two more images showing how the same species appears from a distance. 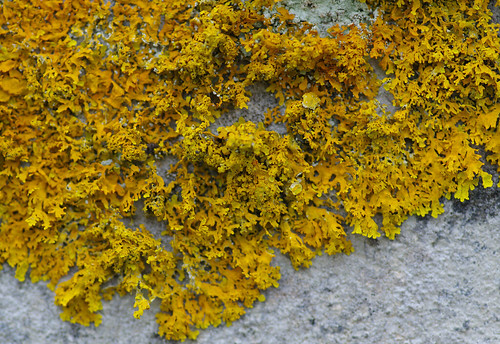 This fluffy yellow algal form can be often found on the walls of old buildings. 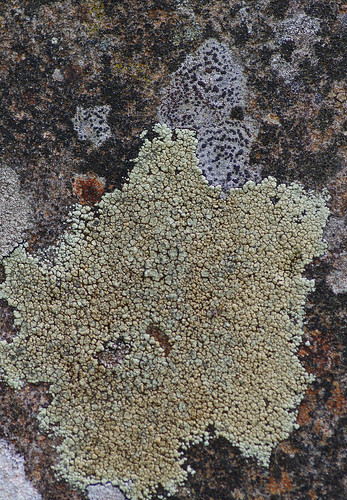 Although the central parts are grey (matching a Caloplaca teicholyta again) the rest suggests otherwise. 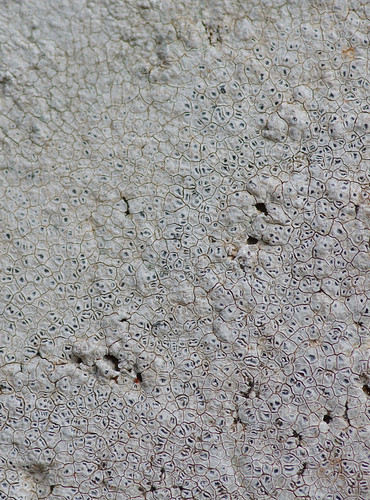 Diploicia canescens seems to have several guises, many of which have led us down the wrong path. One of our biggest challenges is matching up what we have seen to photographs in books and images online. I simply can't believe that we are finding so many unique, unrecorded species on our walks. Another problem is when you are faced with more than one candidate and there is no clear winner! The end result of both problems is the same: file under unresolved mystery and move on to the next case, hoping for a sense of closure. 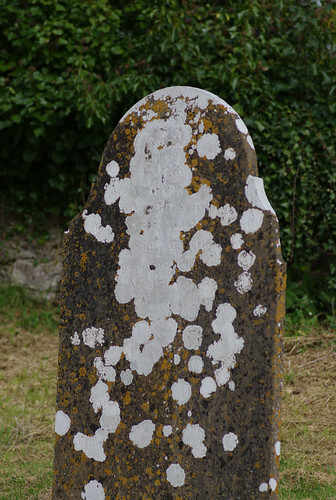 From a distance, there appears to be dried paint on this headstone. 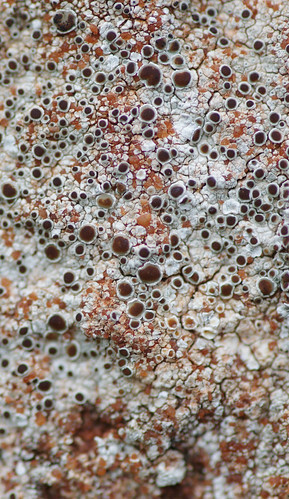 By getting closer those circular splodges of paint are revealed as more samples of Aspicilia calcarea. 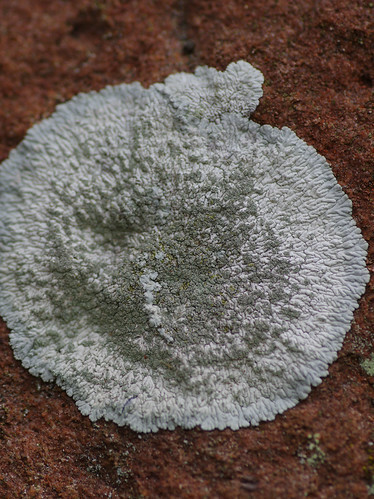 This is probably an older specimen, having broken up in the middle. 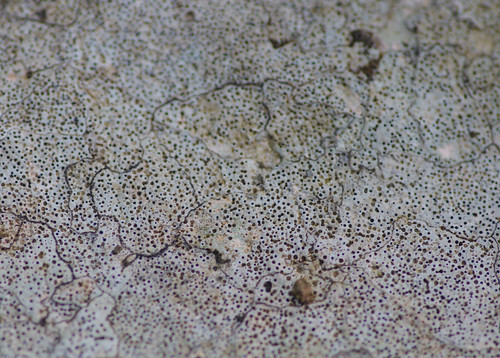 It is scurfy near the centre but the longitudinal stranding pattern at the edges is more extended than in other Diploicia canescens specimens we have come across. Perhaps this is a different species after all. At first glance this appeared to be in one of two camps. 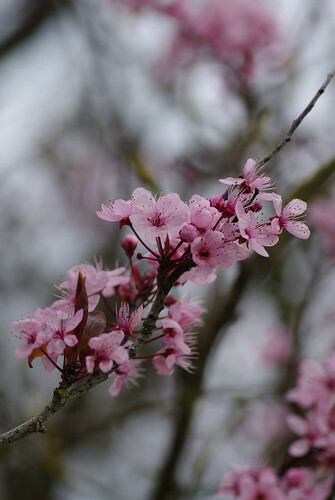 The Verrucarias and Acarosporas are both crustose, and, to my untrained eyes cannot be separated. There are many other inconspicuous-looking species with similar characteristics. This one is going to be filed along with all the other unsolved cases. This new species can be sufficiently distinguished to ward off any confusion. 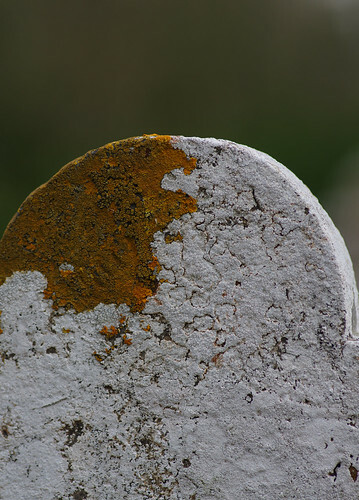 On every gravestone, there seemed to be something of interest to ponder. 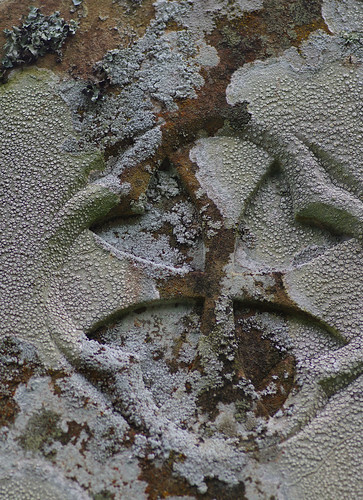 The same species has contributed to a wonderful mosaic effect on the headstone above. I particularly like the beading around the edges. And here is another medley to create confusion. 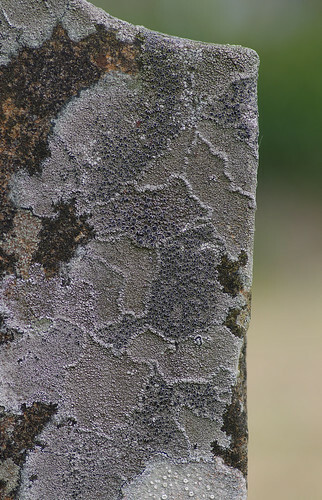 At some point I hope we can return to this churchyard and make a more detailed examination. At least we will be almost assured to find the same specimens - provided we manage to locate the right gravestone, of course. 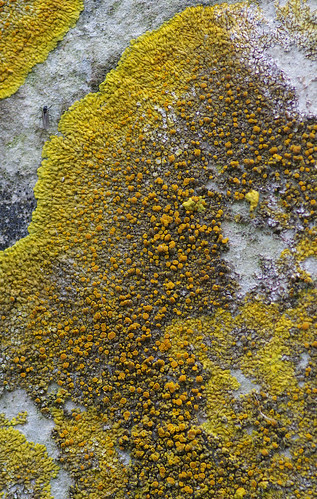 The lobes of the above are more convoluted than Xanthoria aureola. To my eyes it looks most akin to Candelaria concolor but I am not entirely convinced. Again, we will have to return to make a more thorough examination. This one is probably Tephromela atra (variation atra). 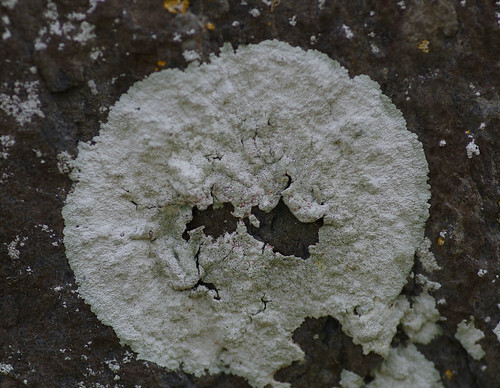 But Lecanora gangaleoides is very similar. 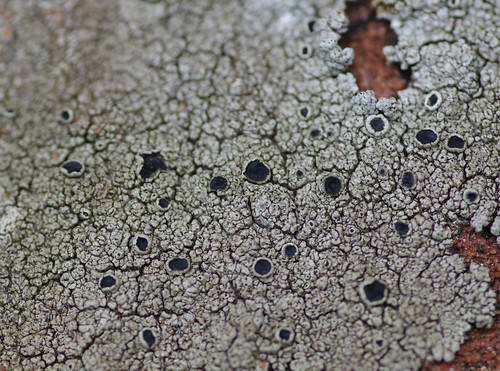 Apparently the two species can be separated by cutting the apothecia. 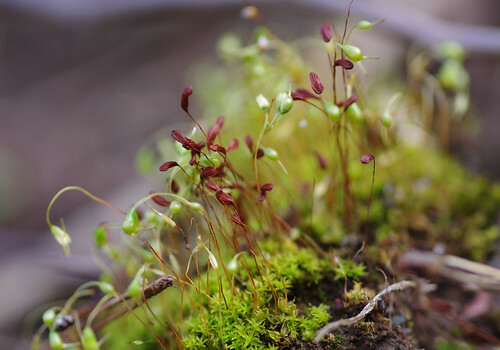 The first species has a purplish tinge, the second can be dark green or brown. 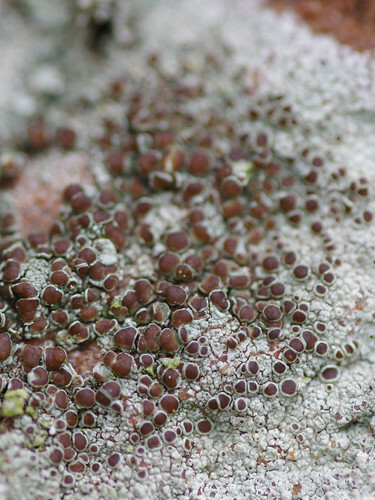 This is another example of Ochrolechia parella. We moved to the church walls and began examining them in the same way we had searched the headstones. 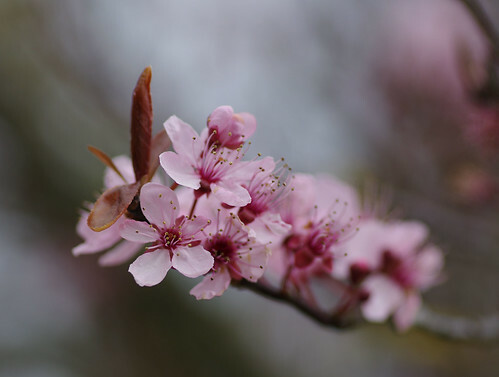 After a while of intent gazing it is easy to immerse yourself in the fascinating micro-world and forget about your surroundings and what's going on around you. 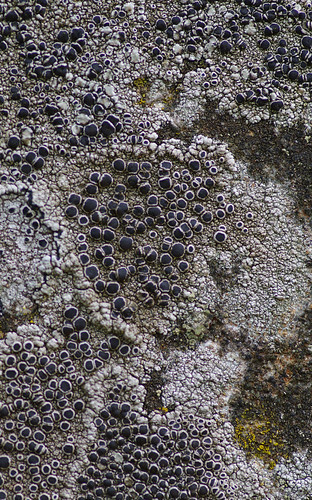 Under extreme magnification there are tiny black dots in the apothecia at the top left of the picture (a species of lichenicolous fungi, perhaps?) 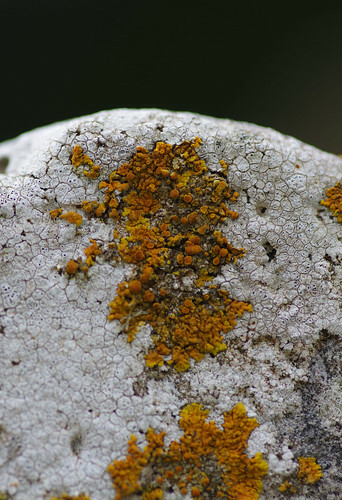 The scattered orange areas could also be a different species. Up close, they bear a close resemblance to wine gums. But before we totally lost our sense of perspective we were brought back to reality. Our spirits were truly lifted. And if a camera could possibly have feelings it would surely have shared the sentiment. To two grateful pairs of eyes it captured exactly the glorious colours we had witnessed. We had continued round the church walls, sat under an ancient yew for a few moments and left the churchyard by the same path as we had entered. For the brief final leg of our walk we passed the Church House Inn and cut a leisurely left back towards the river. Another left took us down Mill Hill. Near the top of Mill Hill, we were fortunate enough to add another species to our modestly growing tally. On the top of a wall, some earth had been recently disturbed. This moss was easy to identify. After a day of many mysteries, it was pleasing to arrive at something clear-cut and brought a satisfying note to the end of our walk. Our recent experiences have led us to reassess our goals for this site. 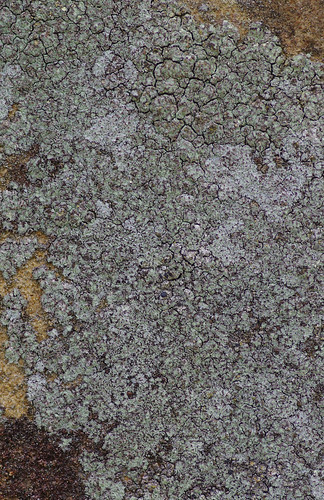 For the last few months the main focus has been lichens. I have come to realise that even the experts cannot rely on identification by sight alone. We need to start taking proper observations. And we also need proper equipment. Trying to second-guess things of this scale without a hand-lens is almost hopeless. 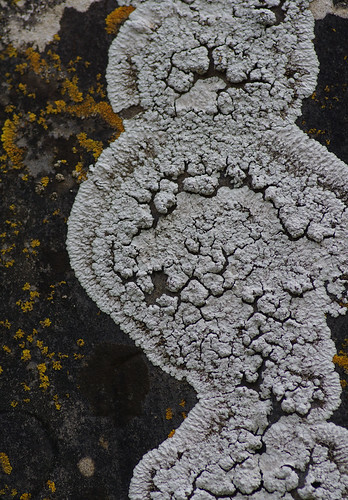 Lichens can (and do) make wonderful compositions. But perhaps we have been missing out on the bigger picture and neglecting the wider scheme of things. Now's the time to correct that imbalance. By being the best all-round naturalists we can be (and not swatting up on the equivalent of one subject) I'm quietly confident we can take this site to another level. Then and only then we might do the name justice, capturing the mind-blowing diversity of life found in different habitats - from moor to coast.